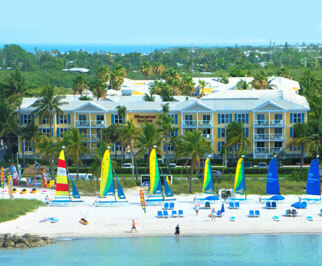 Discover an island getaway at Sheraton Suites Key West. Ideally located across from Smathers Beach, and just minutes from Key West International Airport, this beachfront hotel offers spacious suites with separate living areas, granite bathrooms and deluxe amenities. Many of the suites boast balconies with pool or ocean views. Enjoy all-day indoor and outdoor dining at the Coral Crab Café, or grab a light snack and signature drink at the Cabana Bar overlooking the lagoon-style pool and cascading waterfall. Take a trip downtown in their complimentary shuttle, or enjoy their complimentary nonnotarized watersports at Smathers beach.